Home / Shop – Vintage Watches For Sale Used & Antique / Available / NSA bracelet 20mm. 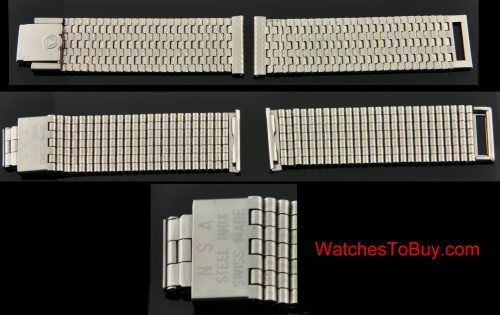 This vintage NSA bracelet is VERY high quality and fits a 20mm. vintage watch. This bracelet came off a Zenith El Primero, but will fit any 20mm. lug width. You will need to have a small to mid wrist to fit this bracelet, which measures 6.3 inches. Many extra links are available on eBay. Only $200.